I’m going to sketch a trajectory for making rhetoric, which has always been at the heart of city-making and community building, even more vital in an era of Smart Cities. My project is an iterative, emergent and collaborative effort, so I’d love to benefit from your insights going forward. 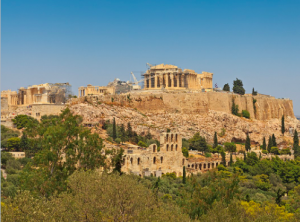 Since before the time of Aristotle, rhetoric has been at the heart of city making, supporting new kinds deliberation, democracy and identity formation as part of the daily lives of citizens. Aristotle says that the size of the ideal state should be limited to one where that is entirely visible at a glance, allowing the voice of a rhetor to be heard by every citizen. We live in a different era than Aristotle, with a very different scale. Over the next 20 years, $41 trillion will be invested in smart city initiatives. Under the banner of “smart city” new assemblages of sensors, databases and algorithms give cities new capabilities as they grapple with a rapidly changing economic, technological, political and environmental climate. Smart City projects promise efficient solutions to energy usage, traffic management, stormwater runoff, economic development, crime management and many other issues city managers face. 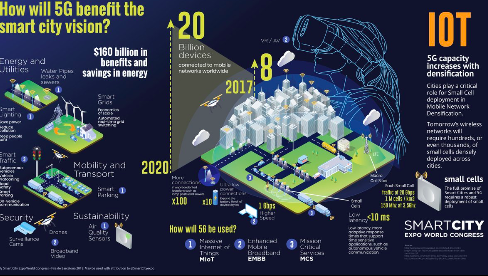 The label “Smart Cities” celebrates a bright, shiny future and charts like this one celebrate new technical capabilities. Unfortunately, the current discourse around the future is centered on “technologically deterministic fantasies,technological values — like logic, predictability and efficiency — will be erroneously imposed upon the built environment, leading to urban spaces that fail to take into account delight, pleasure or human connection. This focus on efficiency is driven by budget concerns, but the political consequences extend far beyond the value of efficiency. These consequences are deeply political, not just in their consequences for the distribution in the allocation of resources that differentially impact different geographic areas. 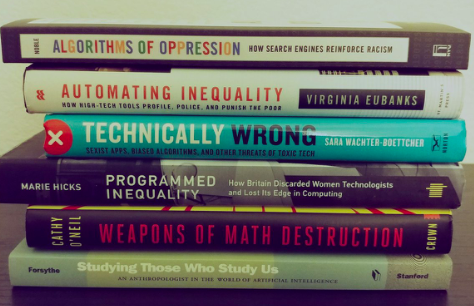 The social categories entangled in algorithms constitute new collective identities. How are these identities represented? What new values and visions of the future arise? How will deliberations be structured to include emergent groups? “Invite more diverse thinkers, like architects and urban planners, into the process of imagining and designing the autonomous future: sociologists, fiction writers, Buddhist monks, poets and rabbis as useful stakeholders,” argues architect Marshall Brown, in critiquing the program illustrated in the space pictured here, a testing circuit in Michigan for autonomous vehicles, marked by a complete absence of people. If we are going to create Smart Cities worth living in, decisions need to include a wide range of voices. The history of industrialization and modernity in the twentieth century holds ugly lessons of the ways in which deeply unequal policies built divisions of race and class into the infrastructures of cities. Highway building, zoning codes, restrictive covenants, suburban mortgage subsidies, policing strategies, and educational funding mechanisms helped to create the deeply unequal world we live in today. These divisions weren’t outcomes that developed out of a collection of personal preferences; instead, these divisions were produced through the force of law, as Richard Rothstein’s recent book amply documents in cities across the country. This logic of inequality shaped metro areas across the US. Policies that were sold as progressive, like the Federal Mortgage subsidies that helped end the Great Depression, continue to shape even liberal cities, like this map of Minneapolis demonstrates. 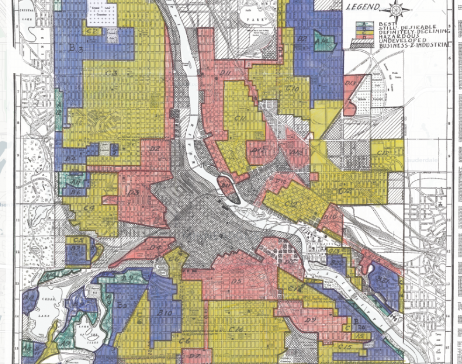 The red shapes on the map made it impossible for African American residents to access Federally subsidized loans, leading to decades of disinvestment and stigmatization. The social divisions of Jim Crow and redlining are replaced by Smart City databases. 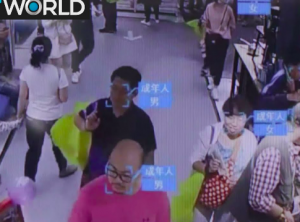 Cities in China have already begun to couple video cameras, facial recognition, and citizenship scores to monitor individuals, opening opportunities to some categories of people and constraining the life chances of other groups. The impact of algorithms on deliberation and citizenship has been studied by mathematicians, historians, anthropologists, and science and technology studies. But we need rhetoricians to have a seat at the table. What would that table look like? How can rhetoric make a difference in the world? I’ve worked to create a project to address this question. 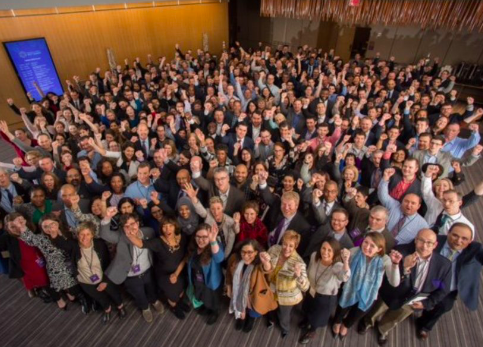 Smart City projects are run by city managers with deep pressures on their budgets, time, and technical expertise, Bloomberg Philanthropies last year brought together city managers from over 100 cities. The humanities are well prepared to grapple with negotiating disparate visions of the future. 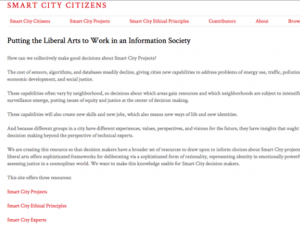 What is needed for humanities perspectives to make a difference in how Smart City projects are adopted? What will it take for humanities perspectives to have a seat at the tables around which decisions are made? These are the kinds of questions I’m working to answer. Because decisions about, for example, street design, must integrate many kinds of technical specialists, from traffic engineers to environmental experts, economic developers, and people who understand the aesthetics of street furniture, overcoming these silos of expertise–each of which have their own history, vocabulary, decision making rationale, and political commitments–requires a level of trust and understanding that only emerges over time. Smart City projects are run by engineers, corporate managers, and government bureaucrats with deep pressures on their budgets, time, and technical expertise, giving rise to a gap between the new technological capabilities and key actors’ ability to make sense of their new governance challenges. The humanities are well prepared to grapple with issues around shared collective identity and the ethical issues of negotiating disparate visions of the future. But the knowledge the humanities creates must be usable and relevant to decision makers if the humanities are to make a difference. 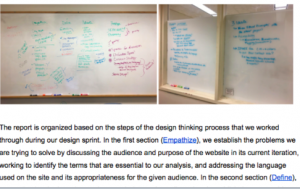 I’ve worked on a series of small steps over the past year to make humanities knowledge usable. 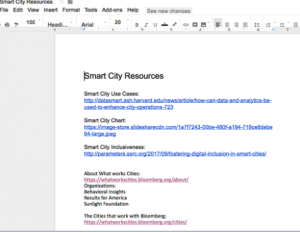 I began by collecting hundreds of articles about smart cities and ethics putting them into an 18 page Google document, which I shared with students as a foundation of ideas, a network of people, and a technical capability to act in the world. The first iteration my students and I produced is the Smart City Citizens Website. 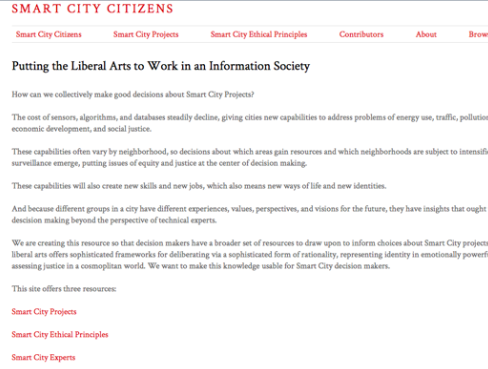 Drawing on the College of Arts and Letters technical capability for hosting and the open source tool of Omeka, designed to meet the needs of museums and libraries, I organized a team of students, specialists and stakeholders to create the Smart City Citizens website. 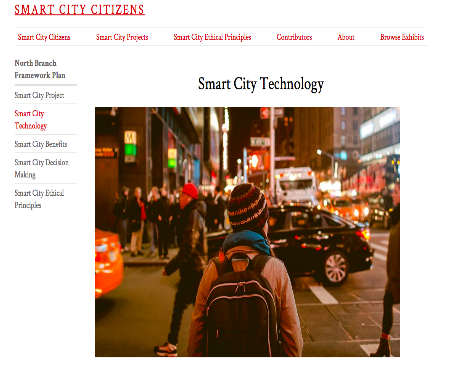 Students in my Digital Rhetoric class produced case studies of more than 20 Smart City projects, understanding what kinds of new capabilities Smart City technologies permit, but also the political process of adoption. The case studies were enriched because the Digital Rhetoric students could draw upon the humanities frameworks developed by my Global Studies students. 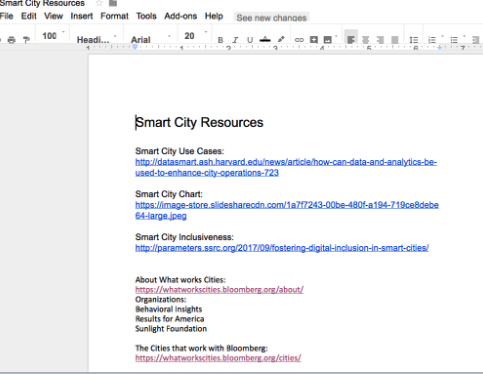 The latest iteration of my Digital Rhetoric class conducted a design sprint, working collaboratively to determine the best ways to shape the Smart City Citizens web site to meet the needs of city managers. 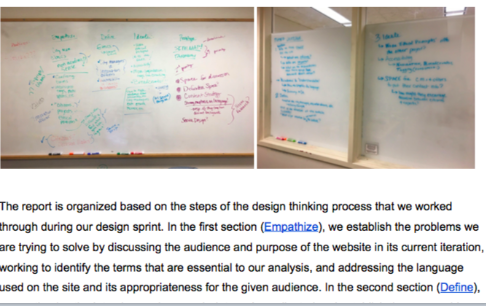 The whiteboards documents the steps of empathy, definition, ideation, prototyping, and testing. 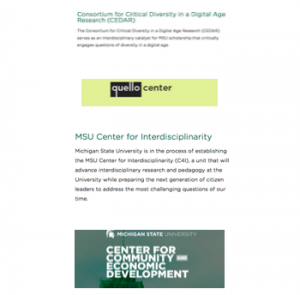 This project is poised to move forward in a significant fashion by networking with specialists at MSU. I’ve coordinated with CEDAR, which has a focus on diversity in a digital age, the Quello Center, the preeminent center for communication policy research, a new center for interdisciplinarity, and the center responsible for training city managers in Michigan and Chicago. 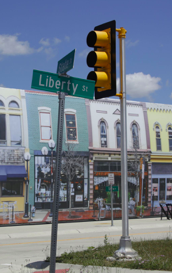 The grant will support a more sophisticated Design Sprint to produce usable humanities knowledge for city managers. 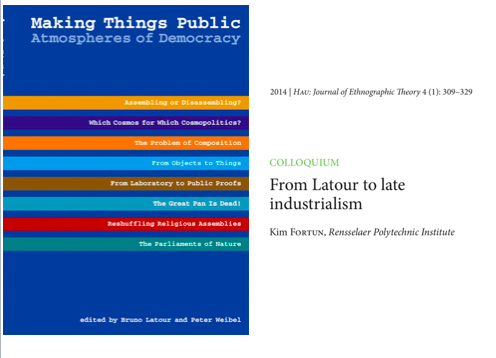 We are building a Latourian network to make Smart City assemblages accountable by creating new ways of supporting emergent publics. 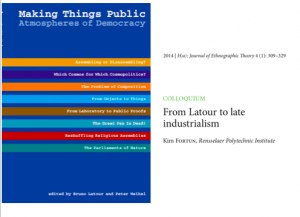 But Latour’s approach must be complemented by a keen recognition of power and inequality, as anthropologist Kim Fortun emphasizes. My project is one strand of a larger set of initiatives like the Critical by Design Conference and the MLA Critical Infrastructure Studies initiative. 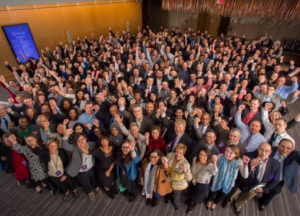 We need new models for identifying, recognizing, and rewarding interdisciplinary work on a large scale, if we are going to make a difference. We can build more vibrant, creative, diverse, green, and sustainable cities. But in an era of multi-trillion dollar investments in sophisticated technologies, we will only get the futures we desire if we assemble the kinds of publics that John Dewey celebrated. Rhetoric should be at the heart of large-scale, interdisciplinary efforts, continuing the heritage of land grant universities.